Paul Pollock will have the option of running the marathon or the 10,000m at the Commonwealth Games and European Championships after achieving the qualifying marks for the track event. Running in Stanford in California on Sunday night, Pollock clocked 28:32.18 for the 10,000m. His time was only .03 outside Dermot Donnelly's Northern Ireland record set back in 1999. However, Pollock's run was over 12 seconds inside the Commonwealth mark. He also bettered Athletics Ireland's European Championship standard of 28:35.00 which means he has also qualified for both the track event and the marathon for the Zurich tests in August. In a field loaded with world-class African runners at the Payton Jordan Invitational meeting, the 27-year-old crossed the finishing line in 18th place but he was happy with his performance in his first competitive 10K on the track. "So that's what a 10K feels like," tweeted the Holywood man. "Tough race but got Commonwealth and Euro Championship standards and missed Northern Ireland record by .03 of a second. It's a start." 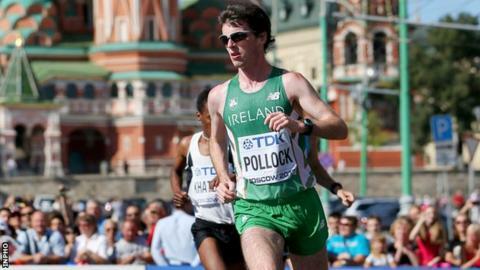 On his major outdoor championship debut last summer, Pollock was a creditable 21st in the marathon at the World Championships in Moscow, as he was the second European over the finishing line. Having already achieved the marathon marks for both the Commonwealth Games and the European Championships, Pollock also wanted to give himself the option of running the 10,000m at this summer's major events. "Hopefully I will run the 10,000m at the Commonwealth Games in Glasgow and at the minute I am thinking that I will probably do the marathon at the Europeans in Zurich," Pollock told BBC Sport Northern Ireland back in December. But the Ulsterman admitted that he was even mulling over the possibility of perhaps doubling up in Switzerland by attempting both the 10,000m and the marathon. "The 10K is three days before the marathon so I don't know whether it's possible to double up or maybe just do the 10K." While he has made his name as a marathon runner over the past 14 months, Pollock believes that the 10,000m will ultimately prove his best distance. "I see no reason why I couldn't go under 28 minutes and I'd like to think I could go in the low 27s," he added in the December interview.